I had the honor of accepting this award from 2 different people last week! Casondra is a new friend. If you haven't visited her before, you should meet her. She is just an incredible woman who gives me a lot of inspiration. I've "known" Kathy for a while, but didn't realize she had another blog! I've been keeping up with what's going on with her grandkids. Thank you both! 3. Pass this on to 15 other great bloggers you recently discovered. 4. 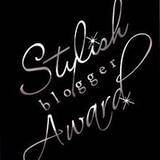 Contact the selected bloggers and tell them about their awards. 1. I'm addicted to the Real Housewives...but "only" NJ, NY, Atlanta, and DC. 2. I don't listen to Christmas music until after Thanksgiving. 3. My favorite thing to do in the winter is to light some candles and watch movies. 4. I'm very, very big on traditions. 5. I'm a rule follower. 6. I moved back to the small town after living away for 20 years. 7. I'm a dog lover, but cats: not so much. If you get a chance, go visit some or all of these ladies! They are all amazing! You are so precious...thank you so very much!!! A lot of your "7" I can relate to, too...I don't think that CHRIST-mas music should be played until after we celebrate THANKS-giving!!! Thank you for the lovely award! I'll blog about it tomorrow! Congratulations. I got this one from Kathy but haven't finished it yet. I already started to listen to Christmas music. Thanks! I have admitted to being an after Halloween Christmas music listener. But I am with you on traditions. That's what holds a family together. I do not listen to Christmas music till after Thanksgiving as well. I would love to remember to keep some ear plugs in my purse so that when I enter a store which is playing the stuff, I don't have to hear it! I have a pet peeve about stations that play Christmas music before Thanksgiving. One of my favorite local stations does this...the day after Halloween no less! I've boycotted them until New Year's. Ugh. congrats on your award and thanks for passing it on to me; what a sweetie you are!! I agree with you about Christmas music after Thanksgiving, unfortunately most of the shops here have already started playing them. Oh well!